I’d like to offer proof-of-life photos and reassure you that yes indeed, the vest has been steeked, finished, and is still alive, but the darned bugger is still damp from blocking and I haven’t been able to get it on to photograph yet. Soon. Soon. It’s cold and it’s vest-wearing time and that Ivy League Vest pattern is some kind of awesome. Instead, I have a story. Settle in my friends. It’s been waiting for a while, and I still can’t believe that I, the queen of impatience, haven’t told it yet. I suppose there is just no underestimating what will happen when you are in the grips of dissertation distress. But anyhoo…First we go back to mid-2006-or-so, when I was watching Veronica Mars DVDs and doodling argyle patterns in my notebook. Veronica, as the modern smart girl’s hip-happening almost-Nancy-Drew and general emblematic young woman fashion-plate, wears kicky things like faux-argyle diamonds, or small amounts of argyle on hoodies or cardigans, most often in bright pinks and greens. And all of this seeped into my subconscious, and I kept thinking, you know, what Veronica really needs is a nice pair of mini-argyle socks. They are worked top-town with elastic knitted into the single-rib cuffs, feature shaping along a faux-seam running up the back of the leg, a short-row heel, and use 2-colour stranded technique in the round. I used Knit Picks ‘Gloss’ in Black and Burgundy (2 skeins each), and 2.75mm bamboo DPNs for a stranded gauge of 8 sts/inch. They are warm and smooth, thanks to the blend of wool/silk contained in the Gloss. These ones here are made to fit my 15.5-inch shapely calves, to a length of about 14 inches or so between the cuff and heel. A knit saga almost at the end. Whaddaya think, my knitting friends? Good enough for mass consumption? One thing’s for sure – in these socks, you are sure to be noticed, whether Nancy-Drewing it or no. Those are SO CUTE. If I ever get around to learning socks (and colourwork! ), I’d buy that pattern. Those are the cutest socks. I love them! Love them! Very interested in a pattern. Also, where did you get those shoes? Gorgeous! Definitely fit for public (paid) consumption! They are totally wonderful, Glenna! A faux-seam! Elastic worked into the cuffs! My gawd, this even might make me take up colourwork again! What is Knitty like, rejecting these (well, OK, the shorter) beauts? Their blinking loss. And are you planning to include instructions for the shorter version (this from someone who doesn’t wear skirts and wouldn’t ever want to subject anyone to the sight of her hideous calves, even covered with fantabulous argyle socks)? They are gorgeous! I think I prefer the bright pink though – even though I NEVER wear bright colours. btw, I also totally want the shoes the socks are wearing in the first picture! Those are beautiful – I would definitely buy the pattern if you make it available. You ask.. are they fit for mass consumption? Oh mercy! I love and adore these socks like you wouldn’t believe!!! YES!!! I think they are fantastic! I know I have said it before, but I will say it again – you are so totally talented. That pattern is absolutely NECESSARY for the knitting masses out there. If I caould get the hang of knitting socks (I have not stopped trying, but I just cannot get it together) I would absolutely buy that pattern. Absolutely go for it! Those are adorable! I just love the faux seam detail up the back. Good work! Oh my gosh those are the most fantastic socks EVER!!!!!!!!!!!!!!!!!!!!! Get writing!!! Wow! Those socks are ADORABLE! Love the knee sock version! Those are absolutely gorgeous! It’s almost enough to make me get over my fear of colourwork socks! O. M. G. Those rock! I can’t wait for you to get the pattern up. Go you, with your mad designing skills! They are gorgeous socks! I had ordered some yarn to knit some entrelac ones but I might use it for them instead! It embarasses me that there are two things I can’t do in knitting. Number one is argyle. Like real, intarsia argyle with a lot of colors. I just end up with a bunch of triangles attached with a couple stitches. (Number two is kitchener stitch. Seriously. One of the most important things a knitter needs to know how to do. Can’t do it.) Anyway, with this pattern, I could really make a pair if argyle socks. Can’t wait to get a copy of this pattern. Can’t wait to see the finished vest. You’re making me want to drop everything and start one myself! 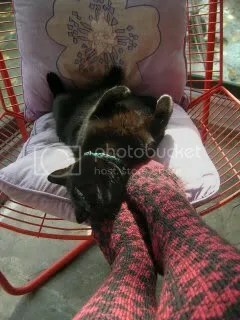 Can I have those cute shoes too? OH my goodness! I have the green argyle sweater Veronica Mars is wearing in that second screen shot!! I’ve seen it around on other people but I had no idea it was so.. well, awesome. It’s one of my favorite sweaters. I like the long ones and the short ones. I’d like to buy the pattern for the short ones too. Try to submit them to MagKnits. I’ll bet ya Jaywalkers are more popular than Monkeys. I clicked on your name on the Harlot’s blog…boy am I glad I did. When you say faux seam… does that mean I don’t have to sew them together after I’m done knitting??? Please e-mail me when you get them for sale. Nice work. Oh Glenna, count me in (again) as one of your admirers…they are lovely! I got the um “recruits” boxed up and ready to ship out (hold your nose for the alcohol fumes…) and then discovered that I’ve “somehow” erased the email with your address. I’m sorry — what should have been a simple “send the box” operation is not, but alas…could you please resend me your address? okay…yeah…those socks are spectacular! good on ya! They are fabulous! I love that s’eam’ up the back….. I adore them. Awesome socks! Can’t wait until the pattern release! This is very late, but wow, those are super cute. As are the shoes, for what it’s worth! Yes, I need these socks. Please write up the pattern so I can knit one up! I also like the socks a lot, but I just love the shoes! I’m looking for that kind of shoes for ages! I’d also like to know where to get them but probably they would be too small for my huge feet again…. Please- Need pattern! 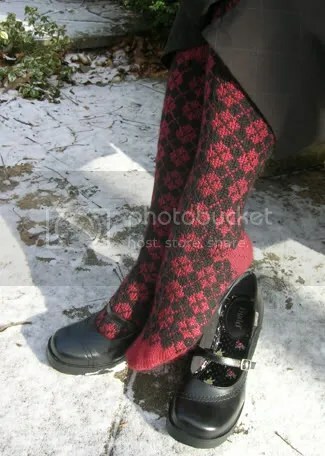 Have sister’s birthday coming up and this is the only pair of argyle knee-high socks I have found any where! Please help!